Nevertheless, man has been using wine as a medicine for over 5,000 years. The Old and New Testament speaks of wine as a sedative, antiseptic, and healing agent. Hippocrates, the Father of Western Medicine, advocated the use of wine to treat practically every illness he had identified. He noted, “Wine is fit for man in a wonderful way, provided that it is taken with good sense by the sick as well as the healthy.” Another Greek physician, Pliny the Elder, described wine as a medicine in Naturalis Historia, and said, “Nothing is more useful than wine for strengthening the body and more detrimental to our pleasures if moderation be lacking.” Paracelsus was a German physician in the Middle Ages who is considered the father of modern pharmacology. He stressed the tonic value of wine and invented the word alcohol. He proclaimed, “Whether wine is nourishment, medicine or poison, is a matter of dosage. The singular message that rings out from the proclamations of these historically prominent men is that wine can be healthful when taken in moderation. 1991 was to be the seminal year that brought this message home to the American public. 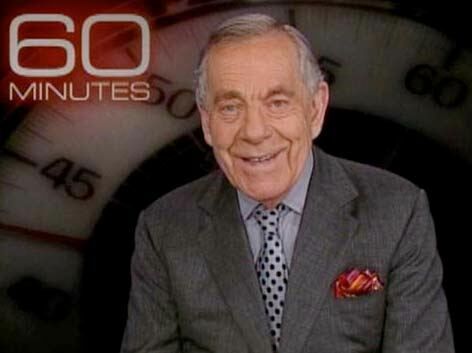 At a time when the federal government’s Dietary Guidelines for Americans admonished the health benefits of alcoholic beverages, Morley Safer hosted a television feature on 60 Minutes about a health conundrum known as the “French Paradox.” The program featured two medical experts, Curtis Ellison, M.D., Professor of Preventive Medicine and Epidemiology at Boston University School of Medicine and Serge Renaud, M.D., Professor of Cardiology and Research Director at Sagalen University in Bordeaux, France. In 1995, Research Fellow Dr. Morten Gorenbaek published the Copenhagen Study, comparing the health effects of beer, wine and spirits. He concluded, “Low to moderate - 3 to 5 drinks - of wine is associated with lower mortality - up to 50% - from cardiovascular and cerebrovascular disease and other causes. Similar intake of spirits implied an increased risk of up to 34%, while beer drinking did not affect mortality.” The same year, Morley Safer traveled to Copenhagen and reported on the Copenhagen City Heart Study on 60 Minutes.He reported that wine consumption had risen by 30% in Denmark in the preceding 20 years while heart disease had declined by 20% in the previous 15 years. The findings were thought to be due to a switch to wine. Ten years late, in 2005, the United States Government finally conceded in the United States Dietary Guidelines. “Alcohol may have beneficial effects when consumed in moderation in middle-aged and older adults. The lowest all-cause mortality occurs at an intake of one to two drinks per day. The lowest coronary heart disease mortality also occurs at an intake of one to two drinks per day. Morbidity and mortality are highest among those drinking large amounts of alcohol. Those who chose to drink alcoholic beverages should do so sensibly and in moderation - defined as the consumption of up to one drink per day for women and up to two drinks per day for men.” The 2010 Dietary Guidelines for Americans which were published January 11, 2011 (www.cnpp.usda.gov/DGAs2010-DGACReport.htm) took a similar stance and are summarized later in this issue. Most of the health benefits of wine have been attributed to a combination of alcohol and the so called “miracle molecules,” the polyphenolic compounds found in the skin and seeds of red grapes. Many research studies suggest it is the polyphenols in wine that give it superior health benefits over other alcohol beverages, but this has not been completely proven. During fermentation, alcohol extracts the polyphenolic compounds into wine in a form in which the body can absorb them. Because of the alcohol, the polyphenols exist in a stable form. Polyphenols are also found in oak, and can be absorbed by wine while aging in oak barrels. 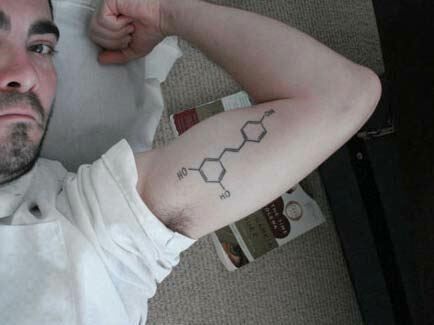 For example, the vanilla flavor in wine is attributable to the polyphenol, vanillin. One glass of red wine has 200 mg of polyphenols compared to 40 mg for white wine. 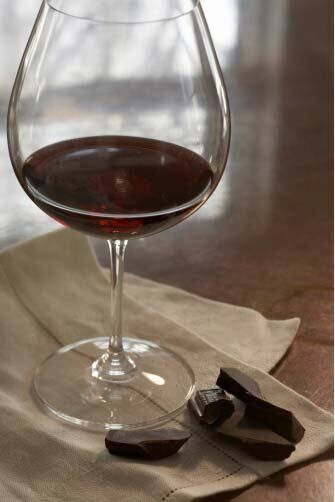 Two glass of red wine a day will enhance the polyphenol content of the average diet by 40%. Of the three classes of polyphenols, flavanols, flavonols and anthocyanins, the anthocyanin resveratrol is the best known and most extensively studied. It is found primarily in the skin of red grapes where it is produced in response to stresses such as fungal infections. 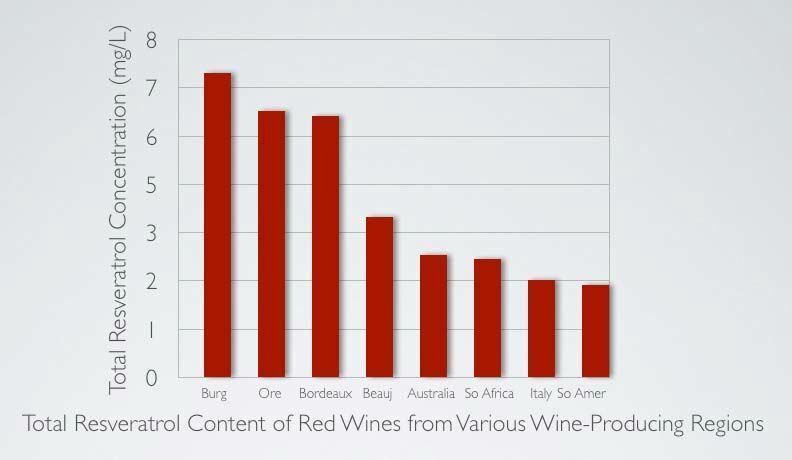 The highest levels of reservatrol are found in wines from cooler climates and Pinot Noir produces wine with the highest resveratrol counts regardless of where it is grown. Wine is superior to table grapes, grape juice and raisins in total polyphenolic content (table grapes are grown in hot climates, polyphenols are not stable in grape juice, and polyphenols disappear in strong sun making raisins a less desirable source). 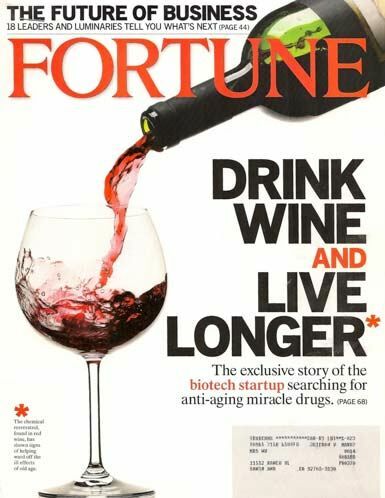 Thus far, the research on reservatrol has been performed in yeast, worms, fruit flies, and mice, and the dosage required in humans to duplicate the favorable effects on health and aging observed in these studies would require the impractical ingestion of hundreds of bottles of Pinot Noir daily. Although resveratrol is the focus of most investigation, it is feasible that a combination of polyphenols found in red wine, rather than resveratrol alone, is responsible for the observed health benefits. The action of polyphenols in the human body are poorly understood at this time. We do know they are potent antioxidants that can attack and destroy free radicals (waste products in human body that interact with important cellular components such as DNA or the cell membrane, causing the cells to function poorly or die leading to disease of aging such as vascular disease, cancer, dementia, diabetes and arthritis). They are also anti-inflammatory agents that can tell cells to produce a particular protein to fight off illness. In 2004, Harvard Medical School researcher David Sinclair along with Dr. Christophy Westphal launched Sirtris Pharmaceuticals, a Cambridge, Massachusetts research company to develop drugs based on polyphenols that could treat specific diseases and in particular ones that influenced the longevity gene, SIRT1. Sirtris Pharmaceuticals was acquired by GlaxoSmithKline for $720 million in 2008. An experimental drug, SRT501, containing resveratrol as the main ingredient, has been recently shown to be minimally effective in patients with cancer and the company has halted trials of the drug. The company’s research on resveratrol-based drugs is continuing. Many knowledgeable researchers in the field believe that the small amounts of polyphenols present in red wine do have significant health benefits. At the 90th Annual Meeting of the Endocrinology Society (ENDO) in San Francisco in 2008, a study reported that the precursors of fat cells exposed to resveratrol in the lab prevented fat cells from increasing and converting into mature fat cells. The authors of this study believe this explains the French Paradox. In the pages to follow, I will summarize peer-reviewed scientific studies published in print, online or presented at scientific forums in 2010 and early 2011, along with other relevant reports that contribute to our current understanding of the roles alcoholic beverages, and in particular wine, play in our health. In 2010, there were over 700 studies published in the medical literature related to alcohol and wine, but I will only include the most relevant and important here. For additional information, consult last year’s summary in the PinotFile (www.princeofpinot.com/article/845/). The 6th International Wine and Heart Health Summit will be held November 2-5, 2011 in the Willamette Valley. This event is open to physicians and any wine lover interested in hearing the latest research on wine and health. I will keep you posted on specifics of this meeting in future issues. Resveratrol and red wine, healthy heart and longevity Heart Fail Rev (September 2010) It appears that resveratrol can induce the expression of several longevity genes including Sirt1, Sirt3, Sirt4, Fox01, Foxo3a and PBEF, and prevent aging related decline in cardiovascular function including cholesterol level and inflammatory response, but it is unable to affect actual survival or life span of mice. Late-Life alcohol consumption and 20-year mortality Alcoholism: Clin & Exp Res (November 2010) A study of primarily men, between ages 55 and 65 found that nondrinkers tend to die sooner, with double the estimated mortality risk of moderate drinkers. Nondrinkers tend to be from lower socioeconomic classes, have more life stress, show more depression, have less physical activity and poorer health habits, but even after these covariates are controlled, researchers found mortality rates were the highest for those who were not current drinkers (51% increased mortality risk), second highest for heavy drinkers (45% increased mortality risk), and lowest for moderate drinkers. Alcohol consumption and risk of cardiovascular disease among hypertensive women Eur J Cardiovasc Prev Rehabil (February 2010) Moderate alcohol consumption is associated with a reduced risk of coronary heart disease among hypertensive women. Light alcohol consumption tended to be related to a lower risk of stroke. Current guidelines for alcohol consumption in the general population also apply to hypertensive women. Alcohol and cardiovascular health Physiol Behav (April 2010) This report is from well-known alcohol and health researcher, Dr. AL Klatsky. The lower risk of morbidity and mortality of light drinkers is due mostly to lower risk of the most common cardiovascular condition, coronary heart disease. A protective hypothesis for coronary heart disease is supported by evidence for plausible biological mechanisms attributable to ethyl alcohol. International comparisons and some prospective study data suggest that wine is more protective against coronary heart disease than liquor or beer. Possible non-alcohol beneficial components in wine (especially red) support possible extra protection by wine, but a healthier pattern of drinking or more favorable risk traits in wine drinkers may be involved. Dietary factors and incident atrial fibrillation: the Framingham Heart Study Am J Clin Nutr (February 2010) Associations between consumption of alcohol, caffeine, fiber and polyunsaturated fatty acids, and incident AF were evaluated. Consumption of alcohol, caffeine, fiber and fish-derived polyunsaturated fatty acids was not significantly associated with AF risk in the study group with a mean age of 62 years. Relationship between alcohol intake, health and social status and cardiovascular risk factors in the urgan Paris-Ile-De-France Cohort: is the cardioprotective action of alcohol a myth? Eur J Clin Nutr (June 2010) The aim of this study was to evaluate potential confounders which may contribute to putative cardioprotection by alcohol. Subjects in the Center for Cardiovascular Disease Prevention (The Urban Paris- Ile-de-France Cohort) were evaluated. Multivariate analysis confirmed that moderate and low drinkers displayed better health status than did nondrinkers. The authors concluded that moderate alcohol drinkers display a more favorable clinical and biological profile (low body mass index, heart rate, pulse pressure, fasting triglycerides, fasting glucose, stress and depression scores, superior respiratory function, social status and physical activity), consistent with lower cardiovascular risk as compared with nondrinkers and heavy drinkers. Therefore, moderate alcohol consumption may represent a marker of higher social level, superior health status and lower cardiovascular risk. Light-to-moderate alcohol consumption and risk of sudden cardiac death in women Heart Rhythm (October 2010) In this prospective cohort study from the Nurses Health Study, the relationship between light to moderate alcohol intake and sudden cardiac death is U-shaped. Women who consumed one to two alcoholic beverages per day were 46% to 42% less likely (respectively) to suffer sudden cardiac death. At three drinks per day, the risk was about the same as nondrinkers. Previous studies had shown that men who drank light to moderate amounts of alcohol had less risk for sudden cardiac death compared to abstainers. The study also revealed that women who had light to moderate intake of alcoholic beverages had 60% less incidence of fatal heart disease. No difference was found among different types of alcoholic drinks. The authors note that the findings may not be all attributable to alcohol, but rather to a healthier lifestyle enjoyed by those who drank moderately. Diet and heart health: moderate wine drinking strengthens the cardioprotective effects of fish consumption Current Pharmaceutical Biotechnology (November 2010) French researchers have described that moderate wine drinking can strengthen the cardioprotective effect of fish consumption. The review addresses the role of two of the specific components of the Mediterranean diet, omega-3 fatty acids and wine, and establishes a link between moderate wine consumption and fatty acid profiles. Moderate consumers of alcohol had higher omega-3 in their system compared to nondrinkers, even when similar amounts of seafood were consumed. The study also found that the hearts of those who regularly consumed wine and omega-3 fatty acids had 20% more heart tissue and a lower rate of heart disease was evident in those who ate fish and drank wine regularly. The researchers recommended around two to four glasses per day paired with fish high in omega-3 fatty acids such as fish with oily flesh including anchovies, herring and mackerel. Patterns of alcohol consumption and ischemic heart disease in culturally divergent countries: the Prospective Epidemiological Study of Myocardial Infarction (PRIME) Brit Med J (November 2010) This study was undertaken to study the effect of alcohol intake patterns on ischemic heart disease in two countries with contrasting lifestyles, Northern Ireland and France. Regular and moderate alcohol intake throughout the week, the typical pattern in middle aged men in France, is associated with a low risk of ischemic heart disease, whereas the binge drinking pattern more prevalent in Belfast confers a higher risk. Lifestyle practices and cardiovascular disease mortality in the elderly: The Leisure World cohort study Cardiol Res Pract (January 2011) The authors explored the association of smoking, alcohol consumption, caffeine intake, physical activity, and body mass index on cardiovascular disease mortality in older adults. In women, alcohol consumption (less than or equal to 3 drinks per day) was related to a 15-30% decreased risk in those less than 80 years old. In men, 4+ drinks per day was associated with a 15-30% reduced risk. Both underweight and obese women and smokers were at increased risk. Moderate alcohol consumption, physical activity and normal weight are important health promoters in our aging population. American Heart Association Meeting Chicago (November 2010) New research from the Nurses’ Health Study suggested that women can safely have a drink or two at middle age and those that do survive more successfully to old age, compared with nondrinkers. Previously, the American Heart Association and Federal Dietary Guidelines recommended women restrict their drinking to one standard drink a day. The study also found that women drinking most days of the week were healthier than those who drank only one or two days a week. A second study analyzed the risk of stroke in 73,450 women in the Nurses’ Health Study and found that women who had a daily drink had a 20% lower risk of stroke compared to nondrinkers. Women on hormonereplacement therapy and had two drinks a day had an increased risk of stroke. A third study presented at the meeting by researchers at the University of Rome found that male heart-bypass-surgery patients who drank two to three drinks daily had a 25% reduction in the rate of subsequent cardiovascular complications like heart attacks and strokes compared to nondrinkers. The risk of dying increased if patients imbibed four or more drinks daily and had a left ventricle heart problem. The benefit in woman after bypass surgery was smaller. A fourth study by cardiologist Dr. Michelle Albert found that female workers with stressful jobs were more likely than women with less job strain to suffer a heart attack or stroke or to have clogged arteries. The high-stress group of women had a 40% greater overall risk of heart problems. Alcohol consumption and mortality in patients with cardiovascular disease J of Amer Coll of Cardiology (January 2010) A study from Italy reviewed fifty-four publications and accepted eight for analysis. Among patients that had had a cardiovascular event, they found that light to moderate drinking (5 to 25 g/day) was significantly associated with a lower incidence of cardiovascular and all-cause mortality. The meta-analysis on cardiovascular mortality confirmed the J-shaped curve with a significant maximal protection (average 22%) by alcohol at approximately 26 g/day. They emphasized that the benefit was most evident in those who drank regularly throughout the week. The researchers claimed that it was alcohol, and not polyphenols, that was the preventive agent. Drinking alcohol temporarily heightens stroke risk Stroke (July 15, 2010 online) Results from the Stroke Onset Study show double the risk for ischemic stroke an hour after consuming as little as a single drink of wine, beer or liquor. Previous studies have linked moderate alcohol intake to a decreased risk of stroke. Heavy drinking is associated with an increased risk for ischemic stroke. Critics of this study point to its small population size and the fact that participants may have had other unrecognized risk factors. If this temporary increased risk is present, it would be outweighed by the long term health benefits of moderate alcohol consumption. Wine may help with slow heart rates Harvard Heart Letter (April 2010) Bradycardia (a heart rate of less than 60 beats per minute) may be helped by a glass or two of wine, since alcohol in moderate amounts speeds up the heart rate. The association between alcohol consumption and mortality: the Swedish women’s lifestyle and health study Eur J Epidemiol (January 2011) Women ages 30-49 years were studied. Compared with non-drinking, light to moderate drinking showed a statistically significant inverse association with total mortality. The results suggest that in younger women, a possibly beneficial effect of light to moderate drinking on future risk of mortality is limited to a prevention of cardiovascular disease mortality but not cancer mortality. Is alcohol beneficial or harmful for cardioprotection Genes Nutr (Ahead of print) The enzyme paraoxonase1 (PON1) can inhibit LDL oxidation and/or inactivate OxLDL. Therefore, PON1 plays a central role in the disposal of OxLDL and thus is antiatherogenic (prevents atherosclerosis). Moderate alcohol regulates liver PON1 gene expression and serum activity, whereas heavy alcohol consumption had the opposite effects in both animal models and in humans. Red wine also has polyphenols such as quercetin and resveratrol that are also known to have cardioprotective effects. The authors have shown that quercetin also up regulates PON1 gene in rats and human liver cells. Both moderate ethanol and quercetin, the two major components of red wine, exhibit cardioprotective properties via the up-regulation of the antiatherogenic gene PON1. Alcohol consumption and risk of atrial fibrillation a meta-analysis J Am Coll Cardiol (January 2011) Results of this meta-analysis of fourteen studies suggest that not consuming alcohol provides the most favorable atrial fibrillation risk reduction. Moderate wine consumption is associated with better cognitive test results: a 7 year follow up of 5033 subjects in the Tromso Study Acta Neurol Scand Suppl (2010) Moderate wine consumption was independently associated with better performance on all cognitive tests in both men and women. There was no consistent association between consumption of beer and spirits and cognitive test results. Alcohol abstention was associated with lower cognitive performance in women. Moderate drinking linked to lower risk of Alzheimer’s disease J of Alzheimer’s Dis (May 2010) A Spanish study suggests a protective effect of alcohol consumption, especially in non smokers. Smoking had no effect on Alzheimer’s risk, but moderate drinking seemed to reduce the risk for the disease. However, women in the study who smoked, but didn’t drink, had no greater risk of Alzheimer’s disease than women who abstained from both. The interactions between smoking and alcohol consumption need to be clarified. Association between alcohol consumption and bone strength in Korean adults: the Korean Genomic Rural Cohort Study Metabolism (March 2010) A growing body of research has shown that chronic alcoholism leads to osteopenia and increased incidence of skeletal fractures, but some studies have concluded that alcohol consumption may be associated with higher bone mineral density in elderly populations. This study investigated the association of alcohol consumption and bone strength in Korean adults. The association between alcohol consumption and risk of reduced bone strength showed a J-shaped curve for both Korean men and women. Alcohol consumption is inversely associated with risk and severity of rheumatoid arthritis Rheumatology (November 2010) This study from the UK looked at the association between frequency of alcohol consumption and the risk and severity of rheumatoid arthritis (RA). There were some limitations to the study (they did not look at the exact amount people drank), but the data suggested that regular alcohol consumption decreased the risk of developing rheumatoid arthritis and reduced the symptoms of those who have already developed it. Nondrinkers were four times more like to develop RA than people who drank alcohol on more than 10 days a month. No difference among the different types of alcoholic beverages was determined. Mediterranean diet and red wine protect against oxidative damage in young volunteers Atherosclerosis (August 2010) This study assessed the effect on oxidative damage of the administration of a Mediterranean diet (MD) compared with an Occidental diet (OD) in young adult volunteers with or without the concomitant intake of red wine. Volunteers on MD showed better antioxidant defenses and less oxidative damage than those on OD. Moderate wine consumption improved antioxidant defenses in both groups and counteracted the oxidative damage observed with OD. Coffee, tea and alcohol intake in relation to risk of type 2 diabetes in African American women Am J Clin Nutr (October 2010) The results suggest that African American women who drink moderate amounts of caffeinated coffee or alcohol have a reduced risk of type 2 diabetes. Combined effect of alcohol consumption and lifestyle behaviors on risk of type 2 diabetes Am J Clin Nutr (June 2010) In adult Dutch subjects, aged 20-70 years, already at lower risk of type 2 diabetes on the basis of multiple low-risk lifestyle behaviors, moderate alcohol consumption was associated with an approximately 40% lower risk compared with abstention. Alcohol consumption, weight gain, and risk of becoming overweight in middle-aged and older women Archives of Internal Medicine (March 2010) A prospective cohort study showed that initially normal-weight women who consumed a light to moderate amount of alcohol gained less weight than their abstaining counterparts and had a lower risk of becoming overweight and/or obese during 12.9 years of follow-up. The best drink for keeping pounds off was red wine. The authors cautioned against making recommendations on alcohol use as a tool against obesity, given the potential medical and psycho-social problems associated with alcohol abuse. Type of alcoholic beverage and incidence of overweight/obesity in a Mediterranean cohort: The SUN project. Nutrition (December 2010) The SUN project in Spain followed drinkers for six years. Beer and spirits consumption was associated with a higher yearly weight gain after adjusting for relevant confounders and was also associated with a higher risk of developing overweight/obesity compared with nondrinkers. No association between wine consumption and yearly weight change or the risk of developing overweight/obesity was apparent. Effect of body mass index (BMI) and alcohol consumption on liver disease: analysis of data from two prospective cohort studies Brit Med J (April 2010) Increased BMI (obesity) and alcohol consumption are both related to liver disease, and there is evidence of a supra-additive interaction between the two. Alcohol consumption and prostate cancer: a mini review Exp Oncol (July 2010) The etiology of prostate cancer remains largely unknown. The high consumption of meat, alcohol and dairy products has been linked to a greater risk. Red wine consumption and risk of prostate cancer: the California mens health study Int J Cancer (January 2010) Red wine contains polyphenol antioxidants that inhibit prostate cancer in animal studies. This report is on data prospectively collected in the California Men’s Health Study. Neither red wine nor total alcohol consumption was associated with prostate cancer risk in this population (ages 45 to 69) of moderate drinkers. Red wine consumption not associated with reduced risk of colorectal cancer Nutr Cancer (August 2010) Red wine polyphenol antioxidants inhibit colorectal cancer development in animal studies. This prospective, multiethnic cohort of middle-aged men were part of the California Men’s Health Study and were members of Kaiser Permanente California Health Plans. Moderate red wine consumption was not associated with reduced risk of colorectal cancer in this population of middle-aged men. Resveratrol, a red wine polyphenol, suppresses pancreatic cancer by inhibiting leukotriene A4hydrolase Cancer Res (December 2010) Resveratrol inhibited tumor formation in a xenograft mouse model of human pancreatic cancer by inhibiting LTA(4)H activity. Resveratrol and resveratrol analogues - structure-activity relationship Pharm Res (June 2010) A number of analogues have been synthesized to improve the beneficial effects of resveratrol. Striking in vivo effects can be observed with hexahydroxystilbene (M8), the most effective synthetic analogue of resveratrol. The authors showed that M8 inhibits tumor as well as metastasis growth of human melanoma in two different animal models. Alcohol consumption and cancer risk: understanding possible causal mechanisms for breast and colorectal cancers. Evidence Report No. 11-E003 Agency for Healthcare Research and Quality (November 2010). Many potential mechanisms by which alcohol may influence the development of breast or colorectal cancers have been explored but the exact connection or connections remain unclear. The evidence points in several directions but the importance of any one mechanism is not apparent at this time. Breast-Healthy lifestyle worthwhile J of Breast Ca Research (October 2010 online) Data from the Women’s Health Initiative Observational Study that began in 1993 including women ages 50 to 79 indicated that women who had regular physical activity (20 minutes of vigorous exercise at least five days a week), maintained a healthy weight, and drank less alcohol (no more than one alcoholic beverage a day) had a lower breast cancer risk with, and without a family history of the disease. Drinking not a risk factor for the most common form of breast cancer J of National Ca Inst (August 2010 online) Data from the Women’s Health Initiative tracked from 1993 to 2005 found that women who consumed seven or more drinks per week suffered a higher risk (double) of lobular carcinoma compared to abstainers but did not have a higher risk of the more common form of breast cancer known as ductal carcinoma (70% of all breast cancer cases). Alcohol consumption and the risk of breast cancer among BRCA1 and BRCA2 mutation carriers Breast (December 2010) BRCA1 and BRCA2 are two gene mutations that increase the risk of breast and ovarian cancer in women. A study of 54 medical centers in eight countries found that exclusive consumption of wine was associated with a significant reduction in the risk of breast cancer among women with BRCA1. The authors of the study conclude that alcohol consumption does not appear to increase cancer risk in women carrying a BRCA gene mutation. Alcohol consumption and breast cancer recurrence and survival among women with early-stage breast cancer: the life after cancer epidemiology study J Clin Oncol (October 2010) This study looked at breast cancer survivors and their lifestyle. Consumption of more than two drinks per day increased the risk of recurrence by 39%, particularly among postmenopausal and overweight/obese women. It is theorized that alcohol increases circulating levels of estrogen and this may cause recurrence of the cancer. Most women in the study were wine drinkers. Alcohol intake was possibly associated with decreased risk of non-breast cancer death. Effect of alcohol consumption on in vitro fertilization Obstet Gynecol (January 2011) Consumption of as few as four alcoholic drinks per week is associated with a decrease in in vitro fertilization live birth rate. Light drinking during pregnancy: still no increased risk for socioemotional difficulties or cognitive deficits at 5 years of age? J of Epidemiol & Comm Health (October 2010) Results from University College London Millennium Cohort Study found that 5-year-old children born to mothers who drank up to 1-2 drinks per week or per occasion during pregnancy were not at increased risk of clinically relevant behavioral difficulties or cognitive defects compared with children of mothers in the not-in-pregnancy group. Children born to light drinkers were 30% less likely to have behavioral problems than children whose mothers did not drink during pregnancy. Children born to mothers who drank heavily or binged were more likely to show hyperactivity and conduct and emotional problems compared with mothers who did not drink during pregnancy. The study’s authors said that responsible drinking while pregnant does not put a child at long-term risk, but did not make an advocacy stance. (Note: The American Pregnancy Association says there is no safe amount to drink during pregnancy, and the more an expectant mother drinks, the more she raises her baby’s chances of having problems). Alcohol in pregnancy may boost child’s leukemia Cancer Epidem, Biomark & Prevent (May 2010) Researchers looked at 21 previous studies of women’s drinking habits during pregnancy and childhood leukemia, and found that women who drank during pregnancy had a 56% increased risk of childhood acute myeloid leukemia (AML). The caveat is that childhood AML is rare and may have many causes. The vast majority of women who consume alcohol during pregnancy will not have a child who develops leukemia, but given the risks associated with drinking during pregnancy, these results reinforce the notion that abstaining from alcohol during pregnancy or in women planning to get pregnant is advisable. Alcohol intake and risk of incident psoriasis in US women: a prospective study Arch Dermatol (December 2010) Non light beer intake in a prospective study of female nurses was associated with an increased risk of developing psoriasis. Other alcoholic beverages did not increase the risk of psoriasis in the study. Testing the validity of the Danish urban myth that alcohol can be absorbed through feet: open labelled self experimental study Journal BMJ (December 2010) The authors debunked an old Danish myth that it is possible to get drunk by immersing your feet in alcohol. They concluded that driving a vehicle or skippering a boat with boots full of vodka seems to be safe and that brewery workers cannot become intoxicated by falling into a brewery vat. Feet are impenetrable to the alcohol component of vodka. FDA tells drink makers not to mix caffeine and alcohol Los Angeles Times (November 18, 2010) Energydrink makers have been warned by government regulators that the combination of caffeine and malt alcohol in beverages is unsafe and do not meet the FDA’s standards for safety. Some of the drinks (Four Loko, Joose, Moonshot) have the same alcohol as four or five beers and the caffeine equivalent of three to four cups of coffee. The caffeine and other stimulants in the drinks produce a “wide-awake drunk.” Several states including Michigan have banned the drinks. The producer of Four Loko drinks agreed to remove caffeine, guarana and taurine from their product. The FDA is expected to ban these drinks completely. Health behaviors of adults: United States 2005-2007 Centers for Disease Control & Prevention (March 2010) 6 in 10 American adults were regular drinkers in 2005-2007. Men are more likely than women to be drinkers (68% versus 55%) and women were more likely than men to abstain from alcohol (31% versus 18%). White people were more likely to be drinkers. The more educated people were, the more likely they were to drink. 74% of people interviewed who have a graduate degree were drinkers, compared to 44% of people with a high school diploma. Possible cure for alcohol intolerance mutation Nature Structural and Molecular Bio (January 10, 2010 online) There are at least one billion people worldwide, mainly East Asians, who have alcohol intolerance due to an inactive enzyme (aldehyde dehydrogenase 2 or ALDH2) needed to metabolize alcohol. If people with this mutation drink alcohol, they develop a flushing of the face, nausea, and an increased heart rate. They are also at risk for certain cancers. Researchers at the National Institute on Alcohol Abuse and Alcoholism have discovered a molecule (Alda-1) that can reactivate the defective enzyme in the presence of alcohol. Potentially, this could be developed into a treatment that would allow those with the inactive ALDH2 enzyme to drink alcohol without the side effects. Alda-1 may also have use as a hangover treatment since hangovers are in part due to the buildup of aldehyde. Alda-1 may have a therapeutic role in heart attacks as well, since ALDH2 can neutralize toxins and lessen damage to heart tissue and Alda-1 can enhance its activity. Boosting resveratrol in white wines Wines & Vines (December 2010) Dr. Oliver Yu and his team at St. Luis Community College’s Donald Danforth Plant Science Center have developed experimental yeast that can make resveratrol. The practical application of this discovery is the possibility of increasing the resveratrol content of white wine, a preferred drink by many which is very low in polyphenolic content. Dose-dependency of reservatrol in providing health benefits Dose Response (March 2010) A review. At lower dose, resveratrol can be useful for maintaining human health including cardioprotection, inhibition of LDL, hindering of platelet aggregation and promotion of anti-inflammatory effects. At higher dose, resveratrol can kill tumor cells. Polyphenols from red wine are potent modulators of innate and adaptive immune responsiveness Proc Nutr Soc (August 2010) According to current literature and the work of these researchers, moderate consumption of red wine seems to be protective for the host in the prevention of several diseases, even including age related diseases from its immunomodulating properties. Resveratrol, sirtuins, and the promise of a DR mimetic Mech Ageing Dev (April 2010) Dietary restriction (DR) delays or prevents age related diseases and extends lifespan in species ranging from yeast to primates. The sirtuin activator resveratrol has been proposed as a candidate DR mimetic. Resveratrol extends lifespan in yeasts, worms, flies and short-lived species of fish. In rodents, extension of normal lifespan has not been observed. Resveratrol protects human retinal pigment epithelial cells from acrolein-induced damage J Ocul Pharmacol Ther (June 2010). The red wine polyphenol, resveratrol, might ameliorate age related macular degeneration. Reservatrol regulates pathologic angiogenesis by a eukaryotic elongation factor-2 kinase-regulated pathway Amer J of Pathology (July 2010) Vision researchers at Washington University School of Medicine in St. Louis found that resveratrol can block the formation of new blood vessels (angiogenesis) as well as eliminate blood vessels that already have begun to develop in the macula of mice. The doses used were considerably more than than found in several bottles of wine. The research opens the possibility of resveratrol as a future treatment for abnormal blood vessels seen in age related macular degeneration, diabetic retinopathy and retinopathy of prematurity, all of which are prevalent eye diseases. Resveratrol aids stem cells in repairing heart damage J of Cell and Molecular Med (August 2010 online) Stem cells were able to more successfully heal heart damage in rats when they were in the presence of resveratrol and the stem cells survived longer with resveratrol treatment. As Valentine’s Day approaches, a few words about chocolate and its health benefits are pertinent. As reported in a number of sources, and in the Los Angeles Times (“Sweet Indulgences,” February 21, 2010), chocolate, like alcohol, taken in moderation has been shown to be good for you. Dark chocolate is clearly the most beneficial form of chocolate since it is flavonoid-rich. Studies have shown that 4 tablespoons of ground cocoa a day give a maximum benefit. Other research indicates that as little as 6.7 grams of dark chocolate a week (equal to three small squares) can be beneficial. To obtain the most benefit from chocolate in candy form, look to dark chocolate with at least 70% or more cocoa solids. Chocolate is not effective when applied in topical form. This section of the Dietary Guidelines for Americans is 16 pages long with several pages of references. I have summarized the important points below. * A large number of individuals exceed the recommended upper limits of average alcohol intake (up to one drink per day for women and up to two drinks per day for men). An estimated 9 percent of men consumed an average of more than two drinks per day and 4 percent of women consumed an average of more than one drink per day. Heavy drinking is also common. * The 2010 Dietary Guidelines Advisory Committee (DGAC) determined that for the following chronic diseases there was not a meaningful incremental change in the research findings since the publication of Dietary Guidelines for Americans 2005. Many scientific studies support a cause and effect. Colon Cancer: There is convincing evidence that alcohol is associated with the risk of colon cancer in a dose response manner, but this evidence is strongest for men and stronger for populations that drink on average in excess of two drinks a day. Breast Cancer: There is robust evidence from more than 100 studies that suggest a dose-response association between alcohol and breast cancer. A woman who drinks, on average, one drink per day has a 10 percent elevated risk. In some studies, the elevated risk attributed to alcohol is attenuated among women with ample dietary folate. Liver Cancer: Rare, but even moderate drinkers have a modest increase in risk compared to those who abstain. A number of personal characteristics play a role. Diabetes: Risk of type 2 diabetes is significantly lower among moderate drinkers than abstainers. Heavy consumption (more than 3 drinks per day) is associated with up to a 43 percent increased incidence of type 2 diabetes. Hypertension & Stroke: Consumption of approximately one drink per day is associated with reduced risk of stroke, while consumption of more than 4 drinks per day is associated with an increased risk of stroke. Light to moderate alcohol consumption may be protective against total and ischemic stroke. Strong evidence exists that moderate alcohol consumption does not elevate the risk of either hypertension or stroke. Total Mortality: Alcohol has a favorable association with total mortality especially among middle age and older men and women. The J-shaped curve, with the lowest mortality risk for men and women at the average level of one to two drinks per day, is likely due to the protective effects of moderate alcohol consumption on coronary heart disease, diabetes and ischemic stroke. Hepatic Effects: Alcohol abuse is the leading cause of liver related mortality in the US but even lower levels of alcohol intake can result in liver function abnormalities short of cirrhosis. Alcohol consumption should be avoided in individuals with liver disease. Young Age: Children or adolescents should not consume alcohol. Pregnancy: Heavy drinking during pregnancy can produce a range of behavioral and psychosocial problems, malformations, and cognitive dysfunction in the offspring. Even daily moderate drinking during pregnancy, especially in the first few months or before the pregnancy is recognized, may have behavioral or neurocognitive consequences in the offspring. The DGAC considered whether recommendations should continue to be based on a maximum number of drinks allowable on a single day or instead be based on an average consumed over the course of a week or even a month. To arrive at a conclusion, further review of the scientific literature was undertaken. Since 2005, there have been a large number of prospective studies of alcohol and chronic disease published and the studies with the greater methodological rigor were included for by the DGAC for review. (1) What is the relationship between alcohol intake and weight gain? Moderate drinking is not associated with weight gain, but heavier consumption over time is associated with weight gain. For those who choose to drink an alcoholic beverage, it is advisable to consume it with food to slow alcohol absorption. (2) What is the relationship between alcohol intake and cognitive decline with age? Moderate evidence suggests that compared to nondrinkers, individuals who drink moderately have a slower cognitive decline with age. Evidence suggests that heavy drinking is detrimental to age related cognitive decline. (3) What is the relationship between alcohol intake and coronary heart disease? Strong evidence consistently demonstrates that compared to nondrinkers, individuals who drink moderately have lower risk of coronary heart disease. There was moderate evidence to suggest that heavy drinking is detrimental. An average daily intake of one to two alcoholic beverages is associated with a low risk of coronary heart disease among middle-aged and older adults. (4) What is the relationship between alcohol intake and bone health? Moderate evidence suggests a J-shaped association between alcohol consumption and incidence of hip fracture. There was a suggestion that heavy or binge drinking was detrimental to bone health. (5) What is the relationship between alcohol intake and unintentional injury? When alcohol is consumed in moderation, the evidence for risk of unintentional injury is less well established for activities such as driving, swimming, and athletic participation, but abstention from alcohol is the safest. (6) Does alcohol consumption during lactation have adverse health effects? When a lactating mother consumes alcohol, alcohol enters the breast milk, and the quantity of milk produced is reduced, leading to reduced milk consumption by the infant. Limited evidence suggests that alcohol consumption during lactation was associated with altered post natal growth, sleep patterns, and/or psychomotor patterns of the offspring. The DGAC recommended that people should not drink if they cannot restrict their drinking to moderate levels, if they are taking prescription or over-the-counter medications that can interact with alcohol, if they have specific medical conditions (liver disease, pancreatitis), or if they are children or adolescents. In addition, alcohol should be avoided in women who are pregnant or who are unsure if they are pregnant and individuals who plan to drive, operate machinery, or take part in other activities that require attention, skill, or coordination, or in situations where impaired judgment could cause unintentional injury such as swimming. Read the full Dietary Guidelines: http://www.cnpp.usda.gov/dietaryguidelines.htm. Only 50 percent of adults are current regular drinkers and 14 percent are current infrequent drinkers. The Guidelines state, “It is not recommended that anyone begin drinking alcohol or drink more frequently on the basis of potential health benefits.” Yet, ironically, the Guidelines clearly acknowledge several health benefits of moderate alcohol consumption. Shouldn’t the Guidelines be advising people to consider incorporating regular low to moderate alcohol intake into their healthy lifestyle, assuming there are no contraindications? Trader Joe’s markets began during the 1950s as a small chain of convenience stores called Pronto Markets. In 1967, the name was changed to Trader Joe’s, the employees were outfitted in Hawaiian shirts, and the first Trader Joe’s market opened in Pasadena, California. Trader Joe’s eventually became a nationwide chain. Its quirky newsletter (“Fearless Flyer”) announced a continual stream of new items that were produced specifically for Trader Joe’s, and the market spurned many commercial brands. Wine was a part of the store from the earliest days. I can remember back to the early 1980s and a Trader Joe’s grocery store in Santa Ana, California where an outstanding array of wines were offered and where I shopped frequently. In recent years, Trader Joe’s has been known for wine values, and in particular, the Charles Shaw line of wines priced at $1.99 in California. The Charles Shaw label is owned by the Bronco Wine Company, but was once an eponymous Napa Valley winery owned by Charles F. Shaw that produced Beaujolais-style wines. The Charles Shaw wines were introduced exclusively at Trader Joe’s grocery stores in California, became hugely popular, and assumed the nickname, “Two Buck Chuck.” The wines include a Cabernet Sauvignon, White Zinfandel, Merlot, Chardonnay, Sauvignon Blanc, Shiraz, Valdiguie, and limited amounts of Pinot Grigio. In recent years, Trader Joe’s has been offering “Hustle Buys.” Usually these wines are acquired from wineries that are trying to clear their inventory and are sold by Trader Joe’s at a deep discount. They are only available for a short time and when supplies are exhausted they are discontinued. Recently, I had heard some reports of excellent value-priced Pinot Noir at Trader Joe’s, namely Burnt Spur from New Zealand and Votre Sante from Francis Ford Coppola Winery. I visited two local Trader Joe’s markets and checked out their Pinot Noir offerings. While there, I saw many people buying Two Buck Chuck in quantity. The wines at Trader Joe’s are on three shelves with the highest quality and most expensive wines on the top shelf. These included many of the usual suspects that are widely distributed in the grocery store marketplace and priced roughly in the $16-$25 range: MacMurray, Cambria, La Crema and Kendall-Jackson. I was more interested in the second and third shelves where the wines cost from $5 to $11 and consisted of labels that were mostly unknown to me. I am sure Trader Joe’s sells more Pinot Noir from the bottom two shelves. These are primarily negotiant labels. I sampled seven Pinot Noirs from various regions of California and one Pinot Noir from the Willamette Valley of Oregon. All had either natural cork or synthetic cork closures. My tasting confirmed the saying that there is no such thing as good, cheap Pinot Noir. That said, there was one wine that stood out and I could recommend it without reservations. I felt that buying middle and bottom shelf Pinot Noir at Trader Joe’s was like participating in the lottery: many disappointments with only one winner. Selectivity is the key, and when you do find a good buy, stock up, because it may not be on the shelf for long. 13.7% alc., $5.99. · Moderately deep reddishpurple color. Scents of underbrush, leaf, old sweatshirt. Light-bodied flavors of strawberries, raspberries, cranberries with minimal tannins. Akin to a rosé in intensity. Decent (-). 14.5% alc., $8.99. · Medium reddish-purple color in the glass. Some attractive aromas of spiced cherries with a hint of barnyard. Ripe strawberry-themed fruit flavor with undertones of cherry cola, mocha and oak and some persistence on the finish. Definitely Pinot Noir in character. Good. 13.6% alc., $8.99. · Deep reddish-purple color in the glass. Shy nose offering demure scents of dark stone fruits, cut flowers and anise. Ripe and raisiny, with cooked plum flavor, and a heavy loamy earth tone. Unsatisfactory. 13.3% alc., $8.99. Produced by Wine by Joe (Dobbes). · Light in color. Decent aromas of well-oaked red berries and cherries. Very light and elegant, offering red fruit flavors backed by a touch of oak. Drinkable. Decent. 14.5% alc., $8.99. Produced by Trader Moon Wine Co. in Manteca, California. · Moderately light garnet hue in the glass. Darkly fruited nose and palate, softly presented with oak char in the background. A back porch wine. Decent. 14.5% alc., $9.99. Produced by Central Coast Wine Warehouse in Santa Maria. Multiple clones and selections. Small lot fermentation and aged in 100% French oak. · Moderately light color. Aromas of dried cherries, grilled mushrooms, cut grass and asparagus. Mediumweight flavors of sweet black cherries and red berries with generous tannins and a green, stem note in the background. Unsatisfactory. 13.5% alc., $17.69. · Moderate reddish-purple color in the glass. Initially the nose offered some pleasingly spiced black cherry and strawberry aromas, but over time in the glass, the fruit faded, unveiling primarily oak and smoke scents. Moderately rich core of fruit with a heavy smoke affected flavor of tar and ash, which, along with the firm tannins, overwhelmed the fruit flavors. Unsatisfactory. 13.5% alc., $9.99. · Deep reddish-purple color in the glass. Enticing aromas of fresh berry pie, ripe black cherries and a hint of allspice. Charming core of berry and dark stone fruits with a refreshing citrus note. Smooth and silky on the palate with nicely balanced dry tannins. A relatively hearty wine that is just plain delicious. A well-crafted and incredible value wine that will match up with many Pinot Noirs costing four times as much. Very good. Castle Rock Winery is a virtual negotiant winery crushing in multiple leased facilities and has no vineyards. The majority of the wine is sourced from long-term contracts that draw on fruit from California (Napa Valley, Sonoma County, Mendocino County, Monterey County, Alexander Valley), Oregon (Willamette Valley) and Washington (Columbia Valley). The brand was one of the first of its kind, started in 1994, at a time when the emphasis was on premium wine labels. When the interest in Pinot Noir surged in the mid 2000s, Castle Rock had already been producing Pinot Noir, and the wave of interest brought the company considerable success. Castle Rock Winery sells many different appellation-specific wines, most for less than $12, including Cabernet Sauvignon, Merlot, and Pinot Noir. Pinot Noir accounts for 65 percent of sales. The wines are widely distributed, and sold on the website (www.castlerockwinery.com) by the case. Ten different Pinot Noirs are currently offered from the 2008-2009 vintages. Greg Popovich is the founder and President. 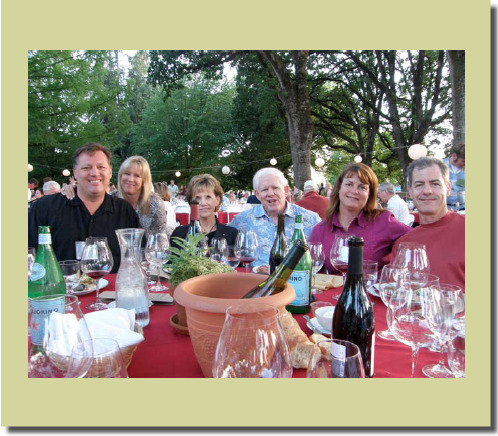 The consulting winemaker is August “Joe” Briggs (producer of the highly regarded August Briggs label Pinot Noirs) who oversees the 600,000 annual case production, making Castle Rock Winery the 25th largest wine company in the United States in 2010. 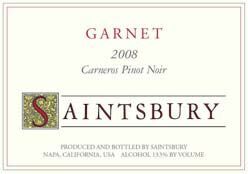 Saintsbury Sells Garnet Trademark & Wine Brand Saintsbury’s “Garnet” wine brand has sold to their long time grape growers, Silverado Winegrowers, the largest independent grower of Pinot Noir for Saintsbury. Silverado Winegrowers plans to expand the brand to include other Pinot Noir offerings from their cool climate vineyards along the coastal regions of California. The Garnet style of Pinot Noir was one of elegance and easy approachability, and the value-priced offering in the Saintsbury lineup. 13,000 cases of the 2008 vintage were produced ($21.98 retail). Silverado Winegrowers also acquired the Garnet winemaking facility, where Alison Crowe, the winemaker for Silverado Winegrowers, has been making Pinot Noir and other wine varietals since 2005. Saintsbury will focus solely on single vineyard offerings from Carneros (Brown Ranch, Lee Vineyard, Stanly Ranch and Toyon Farm) and Anderson Valley (Cerise). Family Winemaker’s of California Tasting Over one hundred and fifty wineries will attend “Tasting 2011” at the Del Mar Fairgrounds on Sunday, March 13 (trade from 1:00-3:00 and trade and public from 3:00 to 6:00) and at the Pasadena Convention Center on Tuesday, March 15 (trade only 2:00-6:00). 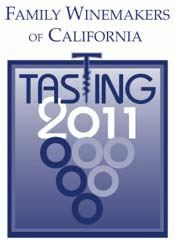 These tastings feature small, family owned wineries and are complimentary for wine buyers and wine media. For more information, visit www.familywinemakers.org. Map of California Wine Regions I found a 2’ x 3’ color map of California showing all the major wine producing appellations at www.delongwine.com. This is the only up to date wine map of California that is currently available. Priced reasonably at $29.95. Wine Bloggers Conference The 2011 North American Wine Bloggers Conference will be held on the East Coast for the first time, July 22-24, in Charlottesville, Virginia. The event has been very popular and sold out the past three years. The popularity of the event is not surprising considering there are currently over 800 blogs on wine. Wines from the East Coast will be featured. Visit www.WineBloggersConference.org. Pasadena PinotFest Sponsored by Mike Farwell and Noir Food & Wine in Pasadena, CA, the PinotFest Grand Tasting with over 100 Pinot Noirs and several Pinot Noir producers will be held at the Altadena Country Club on February 12, 2011. Ancillary dinners (Prodigal Winemaker Dinner on March 6) and Pinot Noir-related tastings are also planned. Visit www.noirfoodandwine for more information and tickets. Classic Wines Auction Offers Commemorative Magnums Every year since 1997, the Classic Wines Auction in Oregon has selected a regional artist to be featured on the Commemorative Magnums. The annual Magnums are etched with the artist’s selected piece, signed by the artist, and filled with wines from a top regional wine producer. This year the limited edition Commemorative Magnum of wine is etched with an image from an original Lucinda Parker painting and contains a blend of Elk Cove’s 2009 Pinot Noir from five single vineyards in the Willamette Valley (Windhill, 5 Mountains, Mount Richmond, Clay Court and Elk Cove Estate). There are 175 Magnums available for $250 each. To pre-purchase one of the Magnums, visit www.classicwinesauction.com. The Classic Wines Auction event, which benefits First Growth Children and Family Charities, will be held March 5, 2011. Millenials Drinking More Wine According to the Wine Market Council reporting at the Sixth Annual U.S. Wine Consumer Trends event in Santa Rosa, CA, 6% of Millennials (ages 17 to 34) are drinking wine daily, 26% are drinking wine several times a week, and 19% drink wine once a week on average. Both Generation X (ages 35 to 46) and Baby Boomers (ages 47 to 65) show more frequent wine consumption over the past five years. The over-65 wine drinkers, who make up the largest proportion of daily wine drinkers, have shown only modest shifts in consumption frequency over the past five years. 20% of the adult U.S. population consume 91% of all wine. The Millenial and Generation X segments of the population are driving wine market growth. WineInfoTag™ This wine bottle neck hanger employs Microsoft Tag technology to allow smart phone users to scan a Tag by using the free Microsoft Tag Reader application on their mobile phone, automatically displaying tasting notes, food pairings, ratings and more. No long URLs to type or SMS messages to send. WineInfoTag™an be used with iPhones, Androids, BlackBerrys, Windows Phones, and other smart phones. Look for these tags to begin showing up on wine retailers shelves as well as on a number of other products. Visit www.wineinfotag.com for more information. Renowned Winemaker Daryl Groom Launches Colby Red Daryl Groom has launched a new table wine blend produced in partnership with Treasury Wine Estates (parent company of Australian Penfolds where Groom once served as a senior red winemaker) that will be sold through Walgreens Drugstores. The brand is dedicated to raising awareness of heart disease. Groom was inspired to create the blend of several red varieties ($12.99) in honor of his 12-year-old son, Colby Rex Groom, who has undergone multiple surgeries to treat a congenital heart defect. Daryl and his wife, Lisa, are committed to support education and research for child cardiac care through an association with the St. Jude Medical Foundation. More information on Colby Red and a video about the project is available at www.colbyred.com. DeLoach Vineyards Sells Pinot in Barrels DeLoach has been selling three-gallon barrels of Russian River Valley Pinot Noir to consumers at the winery on Olivet Road in Santa Rosa and at the new Boisset Taste of Terroir tasting room in Healdsburg. An eco-bag is inside the barrel and keeps the wine fresh for six to eight weeks. The first-time purchase of a barrel and a bag costs $250 and holds the equivalent of four bottles of $24 Pinot Noir. Replacement wine bags are $60 each. Visit www.deloachvineyards.com. Monterey County Interactive Wine Map The Monterey County Vintners and Growers Association has added an interactive map to its site, www.montereywines.org. 178 vineyards are plotted in the county which is 90 miles long and consists of nine appellations. A mobile phone application is also available that can access data from the website. The map can also be printed on a single sheet of paper for reference. 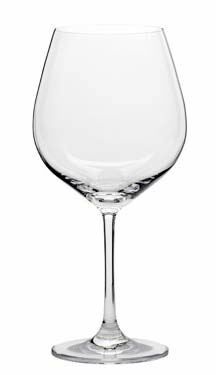 Pinot Noir Affordable Stemware Rankings In the latest issue of Wine Business Monthly (February 2011), a panel of wine industry professionals evaluated affordable stemware for Chardonnay, Pinot Noir and Cabernet Sauvignon. The top-rated stem for Pinot Noir was the Stölzle Grand Cuvée, followed by the Riedel Restaurant series, the Spiegelau Vino Grande and the Stölzle Classic. The top-rated Chardonnay stem was also from Stölzle. Stölzle is a German glassware manufacturer. The stems are available through various retail sources on www.amazon.com. The Burgundy Grand Cuvée is $39 for 4 glasses and the Burgundy Classic is $24 for four glasses. U.S. Wineries Growing Latest data from Wine Business Monthly shows a 9% increase in the number of U.S. wineries in 2010. California has 2,512 bonded wineries and 794 virtual wineries. Washington state is second with 606 bonded wineries and 22 virtual wineries, and Oregon is third with 359 bonded wineries and 150 virtual wineries. The total U.S. wineries number 6,785. Nutrition Labeling Confronts Wine Industry Alcoholic beverages are currently the only consumable product in the United States that doesn’t have nutrition labeling. There is a proposal before the federal Tax and Trade Bureau to list such ingredients as calories, carbohydrates serving size and alcohol per serving on labels. The Wine Institute in California is asking that the labeling requirements be voluntary. Here is my proposed schedule of Pinot Noir-related events I will be attending in 2011. I hope you will join me.